airships - Howden Minster Howden Minster The Collegiate Church of St. Peter and St PaulThere is plenty of evidence to show that former churches have stood on the present site, but nothing is known about who built the first church or what date it was built. There is story that tells us that in the church at Hoveden (Howden) is the tomb of St. Osana, sister of King Osred King of Northumbria, who reigned in the eighth century.If this is to be believed then the first church was built well before AD. 732, the year of St. Osana's death and being such a powerful king his sister would have been bury in a church of some importance.In 1080 William the Conqueror gave the the church and manor of Howden (Hoveden), with all its income to his friend William de Carilef, whom he had just appointed Bishop of Durham, William de Carilef in turn gave the church to the Prior and Convent of Durham retaining the Manor for the himself.The present church appears to have been built using some of the stones of a previous structure and in the Gothic-style of the period. 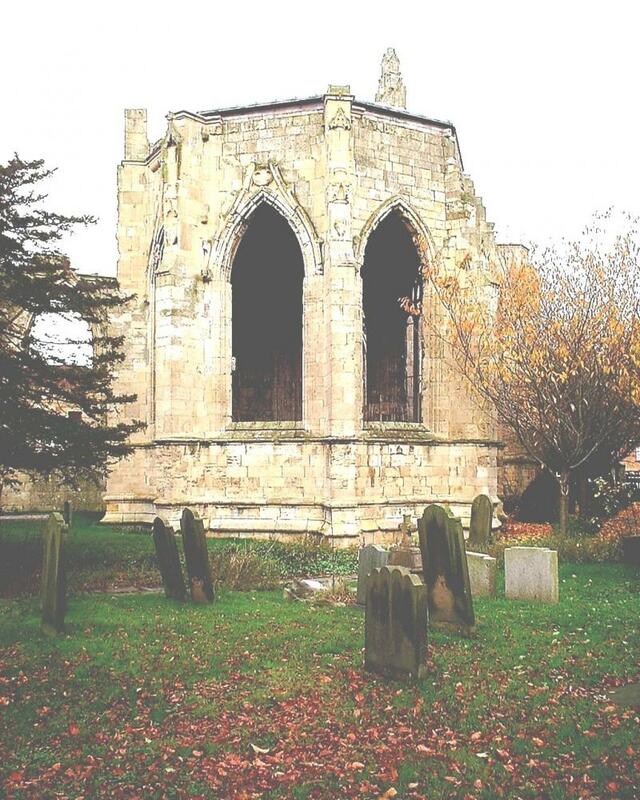 In 1267 it became a collegiate church and was divided into prebends: Howden, Barnby, Skelton, Thorne, and Saltmarsh. Skipworth being added in 1279.The East end of the Minster as it was in the XVIth CenturyThe church is in the form of a cross: the east end being in ruins. The tower, which rises to a height of 135 feet and can be seen from miles around, was built by Bishop Skirlaw, in about 1390 who was also was responsible for the building of the Chapter-house. Unfortunately the Chapter-house is now in ruins the roof having collapsed in 1750,and the interior being eroded by the weather and the droppings of crows and pigeons. Unfortunately the Chapter-house is now in ruins the roof having collapsed in 1750,and the interior being eroded by the weather and the droppings of crows and pigeons. The Chapter-house is one of the finest examples of the pointed arc style of the period in the country. It is octagonal in shape and is similar to the Chapter-house at York, but much smaller. 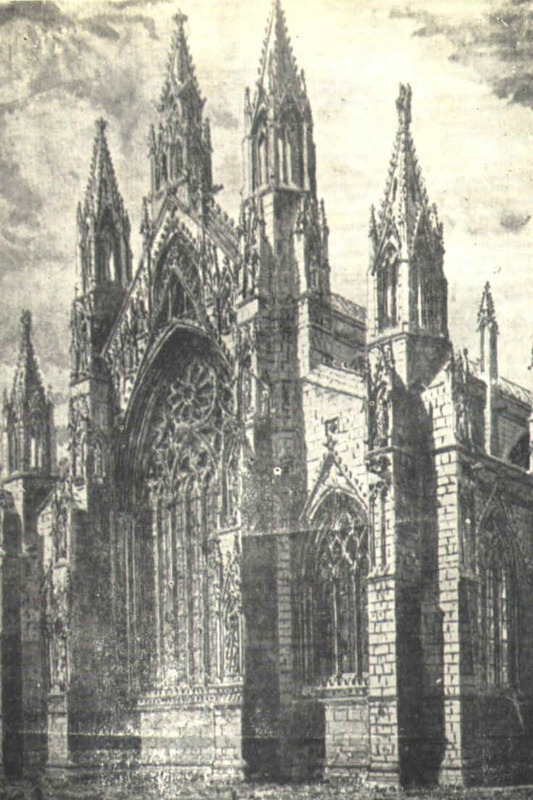 The Chapter-house was described in the booklet The Minster of St. Peter Howden by Thomas Basil King in 1955 as follows;"In this octagonal chapter house, now roofless and much weathered, we have what was the crowning glory of the whole edifice. Its roof, which fell in on St. Stephen's Day, 1750, was a pyramid, beneath which was a groined ceiling. The entrance is formed of an ogee headed archway, approached from the south side aisle of the choir through a short passage. ""The windows are of three lights, with ogee crocketted hoodmoulds externally, and with a wall arcade below them internally, the back of which is richly panelled with quarterfoils below the ogee heads of the arcade. Sculpture formerly covered the walls and canpoied seats were provided for thirty assembled in Chapter. The niches in the upper parts of the angle buttresses contain shields, one of which bears the arms of Ralph Nevill, son of the Earl of Westmorland, Prebend of Laxton in 1416. "Unfortunately the Chapter-house is now in ruins the roof having collapsed in 1750,and the interior being eroded by the weather and the droppings of crows and pigeons. There is plenty of evidence to show that former churches have stood on the present site, but nothing is known about who built the first church or what date it was built. There is story that tells us that in the church at Hoveden (Howden) is the tomb of St. Osana, sister of King Osred King of Northumbria, who reigned in the eighth century. If this is to be believed then the first church was built well before AD. 732, the year of St. Osana's death and being such a powerful king his sister would have been bury in a church of some importance. The present church appears to have been built using some of the stones of a previous structure and in the Gothic-style of the period. 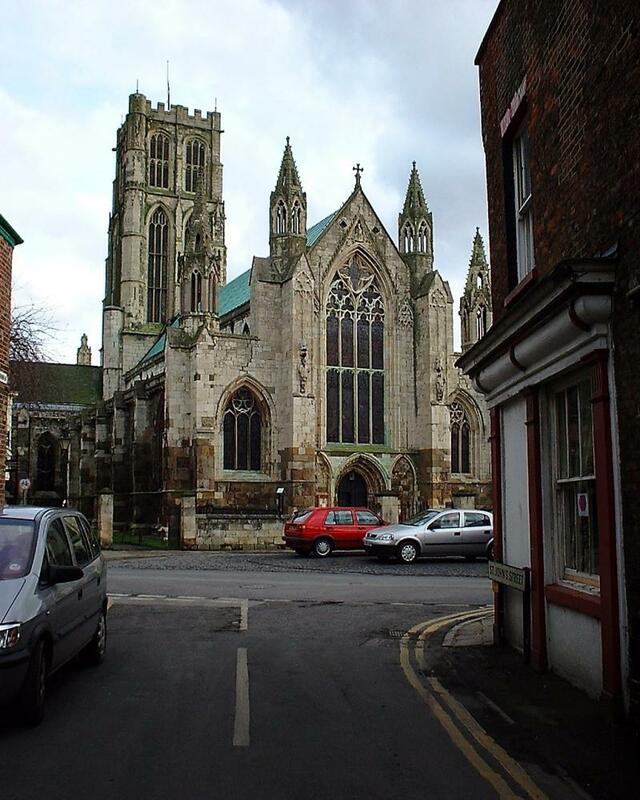 In 1267 it became a collegiate church and was divided into prebends: Howden, Barnby, Skelton, Thorne, and Saltmarsh. Skipworth being added in 1279. The church is in the form of a cross: the east end being in ruins. The tower, which rises to a height of 135 feet and can be seen from miles around, was built by Bishop Skirlaw, in about 1390 who was also was responsible for the building of the Chapter-house. Unfortunately the Chapter-house is now in ruins the roof having collapsed in 1750,and the interior being eroded by the weather and the droppings of crows and pigeons. The Chapter-house is one of the finest examples of the pointed arc style of the period in the country. It is octagonal in shape and is similar to the Chapter-house at York, but much smaller. "In this octagonal chapter house, now roofless and much weathered, we have what was the crowning glory of the whole edifice. Its roof, which fell in on St. Stephen's Day, 1750, was a pyramid, beneath which was a groined ceiling. The entrance is formed of an ogee headed archway, approached from the south side aisle of the choir through a short passage." "The windows are of three lights, with ogee crocketted hoodmoulds externally, and with a wall arcade below them internally, the back of which is richly panelled with quarterfoils below the ogee heads of the arcade. Sculpture formerly covered the walls and canpoied seats were provided for thirty assembled in Chapter. The niches in the upper parts of the angle buttresses contain shields, one of which bears the arms of Ralph Nevill, son of the Earl of Westmorland, Prebend of Laxton in 1416."